Location: Thailand is located in the middle of the Indochinese peninsula. Thailand is bordered to the north and west by Myanmar (Burma) and the Andaman Sea, to the south by Malaysia and the Gulf of Thailand, and to the east by Laos and Cambodia. Thailand is partially separated from Laos and Cambodia by the Mekong River. Click for map. Size and population: Thailand ranks as the world’s 50th largest country which is approximately the same size as France and Spain, two times larger than the UK and about 75% the size of the U.S. state of Texas. Thailand’s population is 65 million. For comparison, Frances’s population is 61 million. Spain’s is 40 million, the UK’s is 60 million and Texas’s is 23 million. The capital of Thailand is Bangkok and is the country’s largest city with 10 million people and ranked as the world’s 17th largest city. Chiang Mai is Thailand’s second largest city with a total population of 700,000 people with 250,000 living in the city center. Geography: Administratively, the country is divided into seven regions: The North, Northeast, Central Plains, East, West, and the Bangkok Metropolitan Region. Each of which has its own distinctive geographical character. The central region, encompassing the Bangkok metropolitan region and the central plains, is affectionately known as "Thailand's Rice Bowl". One of the world's most fertile rice and fruit growing areas, this is the economic and cultural heartland of the Thai nation. The mountainous north is Thailand's largest region. Here, elephants work the forest and winter temperatures are sufficiently cool to permit cultivation of temperate fruits such as strawberries and peaches. The second largest and poorest region is the sprawling northeast. Better known as "Isan", it is largely bordered by the Mekong River, where the world's oldest Bronze Age civilization flourished some 5,000 years ago. Just south of the northeast lies the eastern region. Sandwiched between the sea and the Damrek range, this is where pristine beaches support the growth of summer resorts such as Pattaya. Despite recent development efforts undertaken by the government in the west, its beautiful mountains, which rise up towards the Burmese border and its lush valleys remain relatively unspoiled. The towns here have a frontier atmosphere. Last but not least, the peninsular south. Here, arresting scenic beauty complements the economically vital activities of tin mining, rubber cultivation, and fishing. The Hot (Summer) Season extends from March through May. Daytime temperatures can be unbearably hot during this period. The most pleasant time to visit the north is the cool season between November and February when rainfall is negligible, humidity is relatively low, and temperatures are mild (warm days and cool nights). Chiang Mai's average annual temperature is a pleasant 26 degrees C (79 degrees F). During the hot (summer) season, March to April, daytime highs can reach 40 degrees C (104 degrees F). May to October is milder, with higher humidity, short tropical showers and a daily temperature in the range of 21ºC to 31ºC (70ºF to 90ºF). During the cool (winter) season, night-time lows can drop below 13 degrees C (56 degrees F) in the city and 4 degrees C (39 degrees F) in the mountains. Doi Inthanon and other peaks can experience freezing conditions at night. Annual rainfall totals 1,197 millimeters or about 47 inches. Most of the rain falls during the six months from May through October. September is the wettest month, averaging 251 millimeters. Between December and March there are only traces of precipitation. For the today's and the five-day weather forecast for Chiang Mai, go to: http://weather.yahoo.com/forecast/Chiang_Mai_TH_c.html. For current weather conditions in Chiang Mai and many other Thai cities, go to: http://www.wunderground.com/global/TH.html. For historical weather information about north Thailand, which is helpful for planning a trip and knowing what weather conditions you should expect, go to: http://www.worldclimate.com/. Once you reach the World Climate Web Page, type in "Chiang Mai, Thailand" or the name of any other city you want weather information for. You'll be able to look up average monthly rainfall and average daily high and low temperatures based on data collected by local weather bureaus over many years. For the Western visitor there is no such thing as "cool" so light cotton clothing is the order of the day. Both the weather and practicality means that you want to wear sandals or “flip flops’. Thai culture is to remove your shoes before entering most places (especially temples) and so you want to wear something that is easy to take off. Nights can get cool enough during the winter season of November through February to wear a light jacket or sweater – especially if you are riding a motorbike or plan to visit the mountains. Don't worry about bringing too much clothing with you as almost everything can be purchased locally at a fraction of the price you will pay at home. Don’t be surprised if you find so may things to buy that you also need to buy another suitcase to bring it all back – but check with your airline as going over your allowed luggage weight can cost a lot of money. Do remember that the tropical sun can be quite fierce so a hat is useful and don't forget to use a good sun screen. During the rainy season you will want to have raingear. For walking around a rain jacket or umbrella will keep most of the rain off you. If you are riding a motorbike think about packing a poncho. A poncho will provide the most protection from the rain – wear a helmet and glasses, put on your sandals, roll up your long pants (shorts are better) and drape the poncho over you legs – now you can ride around town and arrive almost dry. Chiang Mai's history: Thailand's second-largest city and the gateway to the country's north was founded in 1296. You can still see the moat that encircled the original city. Chiang Mai’s historic strength derived from its important strategic location near a southern branch of the ancient Silk Road. Long before the modern influx of foreign visitors the city served as an important centre for handcrafted goods, umbrellas, jewelry (particularly silver) and woodcarving. 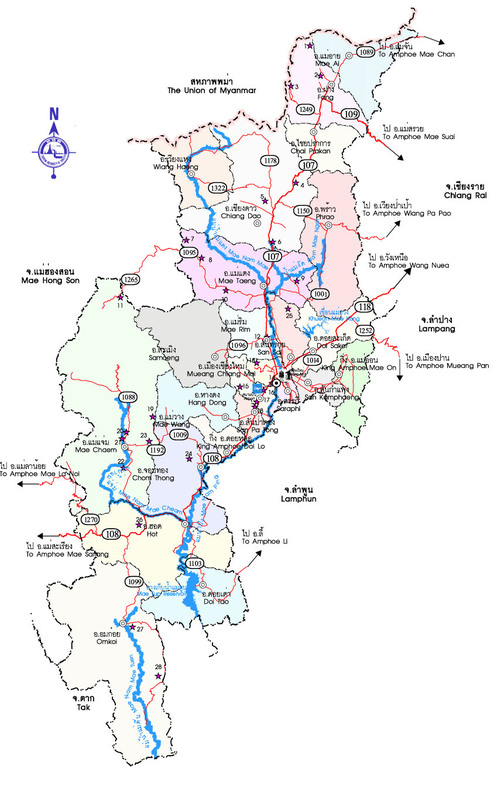 Chiang Mai owes her existence to the Ping River which provided the trade route which could be extended beyond the wall of mountains that surround the Chiang Mai valley. It became a channel for trade from China and Burma to the Gulf of Siam. The wide, fertile valley, able to support a large number of people, became the basis of political power in the feudal kingdom of Lanna (Kingdom of One Million Rice Fields). Archaeological excavations show the area has been inhabited by humans for over two thousand years. However, the city of Chiang Mai was founded in 1296 by King Mengrai as the capital of the first independent Thai state, Lanna Thai. It became the cultural and religious centre of the northern Thai, who had migrated from southern China to dwell in Thailand, and remained so throughout the turbulent period of recurring Burmese attacks. The Burmese finally captured Chiang Mai in 1556 and occupied it until King Taksin retook the city in 1775, driving the Burmese forces back to near the present border. Burmese influence on religion, architecture, language, cuisine, and culture, however, remains strong. Government: Thailand is a constitutional monarchy. Thailand accepted a democratic constitution and elections in 1990’s. Thailand has had many changes in politics with several efforts with democracy. The military has played a key role in Thai politics and most recently staged a military coup in September 2006 which was supported by the King. Since September 2006, the country has been ruled by the military and an appointed Prime Minister without a constitution. With nationwide general elections held in December 2007, the country returned to a democratic, constitutional government. King Rama IX Bhumibol Adulyadej having reigned since June 9, 1946, he is the world's longest-serving current head of state and the longest-serving monarch in Thai history. King rama IX Bhumibol Adulyadej was born in the United States and educated primarily in Switzerland. His Majesty the King is also an accomplished musician, artist, and sailor. His Majesty the King is a symbol of national unity. He is genuinely loved and deeply respected throughout the Kingdom. It is a punishable crime in Thailand to be disrespectful to the Royal Family or their images. Thai is a tonal language which is comprised of five tones - flat, low, high, rising and falling. Be careful, the “same” word can have many different meanings – maybe not the one you wanted! Speaking Thai is also made more difficult because it is unlike many other languages in which a word can be understood in the context of other words. Also unlike other languages it does not always helpful to speak each word slowly but instead to put all the words together in a smooth flow to improve understanding. Although there is an official transliteration of the Thai language to Roman characters you will see many different spellings for a word such as sawadi, sawadii, sawasdee, sawadee for hello/goodbye. Many foreigners (“farangs”) find the Thai language challenging and do not try to learn it. The Thai people are very appreciative of anyone who attempts to use their language and you will always be met with a smile if you try. You will find that traveling around the larger cities such as Bangkok and Chiang Mai that many Thais speak some English. The vendors certainly will be able to help you understand how much something costs. A little knowledge of the Thai language can go a long way to helping improve your price negotiating and not identifying you as a newcomer. How are you? sabai di mai krab/ka? And …learn how to count in Thai! The primary belief system of Thailand is Theravada, Buddhism (Buddhism 95%, Muslim 3.8%, Christianity 0.5%, Hinduism 0.1%, other 0.6%). The southern provinces of Thailand are heavily Muslim and many of the hill tribes have been converted to Christianity. Thailand is the only country in the world literally living in Buddhism. Buddhism is not a religion in that it does not recognize a God but follows the teaching (dhamma) of the Buddha who was a man. The last (28th) Buddha (Siddhattha Gotama) or “Enlightened One” was born in 543 BCE – therefore the Buddhist calendar in 543 years ahead of the Western or Christian calendar (2008 is 2551 on the Buddhist calendar). Chiang Mai has many beautiful Buddhist temples (“wats” in Thai) to visit and many have monks (“pra”) that can speak with you about Buddhism in English. You can also find temples to study Buddhism and meditation. Doi Suthep temple located just outside of the city offers several options for the study of Buddhism and meditation. The monastic community in a wat is called the sangha. The Buddha, Dhamma and Sangha represent the Triple Gems of Buddhism and you will see this in Buddhist practice. Buddhists will show respect to the Triple Gem with three bows to the Buddha’s image. When visiting a temple please observe custom by dressing conservatively. Men and women should cover their legs, shoulders and abdomen – this means no shorts or tank tops. Please remove your hat and shoes before entering the temple. You should not point your feet at anyone and especially images of the Buddha. You may have the opportunity to have your picture taken with a monk but please understand that Theravada Monks are not allowed to touch a woman. Travelers should consult their local health agencies or doctor for information regarding recommended immunizations before traveling to Thailand. Many good sites exist on the internet for travelers. Most of Thailand (larger cities and tourist areas) has been free of malaria for decades. Perhaps the greatest risk for travelers is bacterial and viral caused diarrhea. Good personal hygiene and careful selection and preparation of food and drink are the best ways to avoid both malaria and hepatitis A and E. Other risks for travelers include dengue fever, hepatitis B,C,D; rabies and sexually transmitted diseases. Most visitors may enter Thailand without a visa for 30 days. Entry and length of stay varies by country of origin. Travelers should consult the Thailand Embassy for specific information prior to making travel plans. Visitors from most countries who arrive in Thailand without a visa will be granted a 30 day stay if they have proof of an outbound ticket and adequate funds. For longer stays you should apply for a visa before leaving home. A tourist visa allows the visitor to stay for 60 days, and a non-immigrant visa for 90 days. You should enter Thailand within 90 days of the visa being issued otherwise it will be invalid. Some countries have special agreements with Thailand regarding the issue of visas. Before travelling to Thailand check with the Thai embassy in your country or ask your travel agent for advice. Tourist and non-immigrant visas may be extended after you have arrived in Thailand but this is strictly at the discretion of the immigration office and is not guaranteed. Longer term visas are available but the requirements are more complex. If you plan to leave Thailand for a short trip, and then return before your visa expires, a re-entry permit can be obtained from the immigration office. If you are planning a trip to Burma, Vietnam, Cambodia, or Laos, there are many travel agents in Bangkok who will arrange the necessary visa. Or you can apply yourself at the embassy. Foreigners from countries qualifying for visas on arrival can come in and out of the country as many times as they like with a visa on arrival, but can stay for a maximum of 90 days in any six month period. If they stay 90 days then they must leave for 90 days before they are entitled to another visa on arrival. They can, however, go and request a tourist visa from a Royal Thai Embassy or Consulate abroad and come back into the country. Extensions above the 90-day limit may be granted in exceptional cases, such as if the tourist is suffering from an illness or involved in a lawsuit.